My interest in radio commenced at about age 14-15. For some time my grandfather lived at home with my parents & myself, and he was an x seaman and he frequently listened to SW broadcast stations. 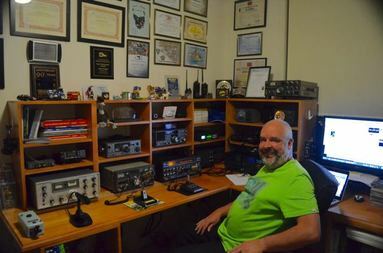 Due to his interest in SW radio, I started listening to broadcast stations on SW and came across amateur radio operators working on the HF bands. I initially used a cheap portable radio with SW facilities but no SSB capabilities. So I improvised and used another radio back to back to act as a BFO. When I was about 16, I purchased a Yaesu FRG-7700 communications receiver, which I still have today. At age 19, with the encouragement of Chris VK5PN, I sat for the regulations exam and Morse code, for the now 'defunct' Australian Novice amateur radio licence and passed both these subjects. Unfortunately due to work commitments, and other interests in life (girls and cars), I never got around to completing the third component, the theory examination. In June, 2010, I attended a 2 day Foundation licence course held by AHARS, and I obtained my Foundation licence callsign of VK5FPAS. Then in June, 2011, I passed the examinations for my upgrade to the Standard licence and obtained the callsign of VK5PAS. I have been a member of AHARS since 2010, and I previously served on the Committee, including holding the position of Vice President. I still hold the posts within AHARS of Awards Manager, and QSL card checking. I am a member of the Wireless Institute of Australia (WIA) and the American Radio Relay League (ARRL). In January 2016 I became a Director on the WIA Board and continued in this role until December 2016. I am an official card checker for the ARRL for their awards including DXCC and also an official card checker for CQ Awards. I am also a member of the WIA Awards Committee. I am also the Awards Manager for the VK5 National & Conservation Parks Award, and I am the Australian co-ordinator for the World Wide Flora Fauna (WWFF) program). I also produce a monthly newsletter called 'Out and About in VK5'. 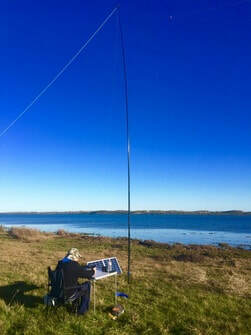 I enjoy many facets of the hobby including DXing, contesting, and operating portable. I have DXCC on 20, 15 and 10m, and getting there slowly on 40m which is a bit harder with 100 watts.